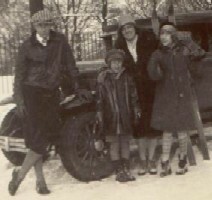 Joseph, Edward, Gladys, and Catherine (née Ehrler) Schwert. Undated photo, probably about 1920. 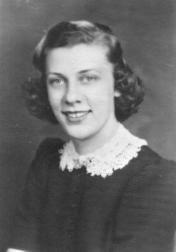 Gladys Ehrler Schwert was born on September 6, 1917, in Buffalo, NY. She was baptized on October 7, 1917, at Our Lady of Lourdes R.C. Church. 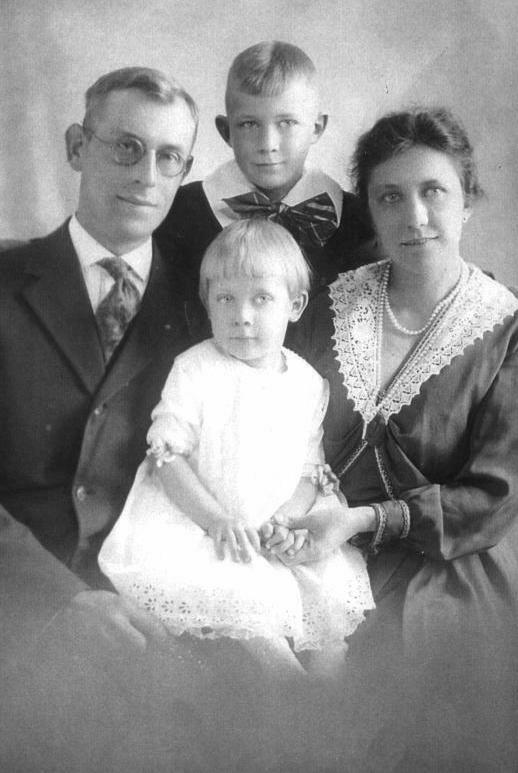 Sponsors of her baptism were her maternal aunt Clara Wagner and her maternal grandfather Edward Ehrler. Gladys was a graduate of the University of Buffalo and worked for many years as a counselor at the Buffalo General School of Nursing. While a student at the University of Buffalo, Gladys met and fell in love with Spencer Sherman Krull, who was born on July 24, 1915. 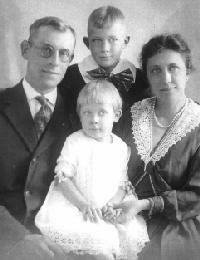 Spencer was a son of Raymond Pratt Krull and Mildred (née Spencer) Krull. 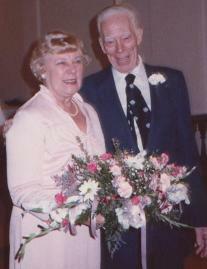 On September 2, 1942, he and Gladys were married at Saint Rose of Lima R.C. Church in Buffalo. 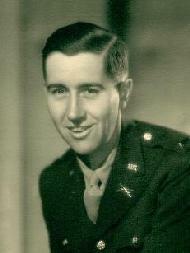 Shortly after the wedding, Spencer went to war, where he was assigned to the Headquarters Detachment, 3rd Brigade, 114th Infantry Division, and rose to the rank of Lieutenant. 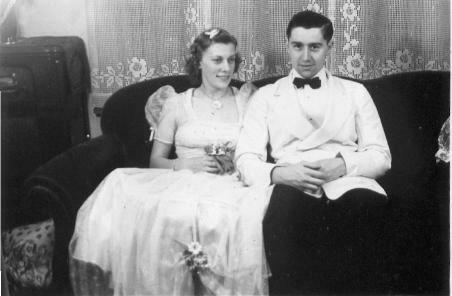 Gladys (née Schwert) and Spencer S. Krull on their wedding day, September 2, 1942. Following the War, Gladys and Spencer had one child, Nancy, born on March 7, 1948. 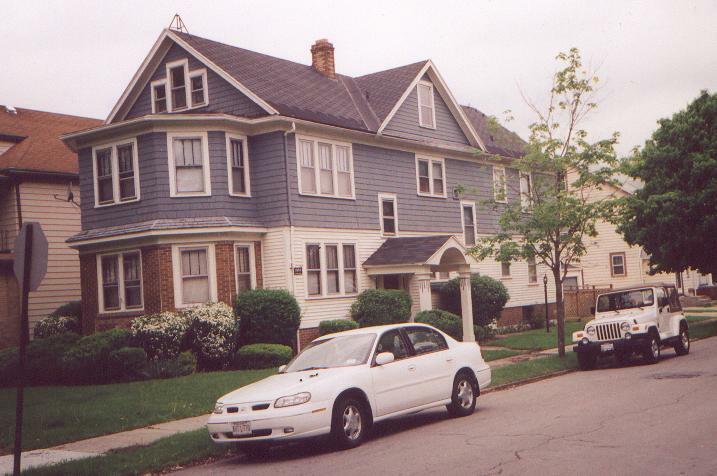 The family resided on the first floor of 1088 Parkside Avenue in Buffalo. Shortly after Nancy's birth, Spencer was diagnosed with an acute form of leukemia. Although in poor health, he strongly desired to go fishing at Honey Harbor, northeast of Midland, Ontario, on Georgian Bay. 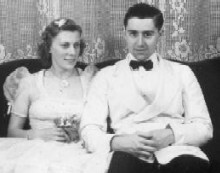 Gladys and R. Pratt Krull drove Spencer to Georgian Bay, and they stayed at a log cabin cottage. Spencer fell gravely ill and died on June 29, 1949. Hughson King, a family friend and local fishing guide, helped to transport Spencer by boat to the nearest hospital, at Midland -- although Spencer might have already been deceased. 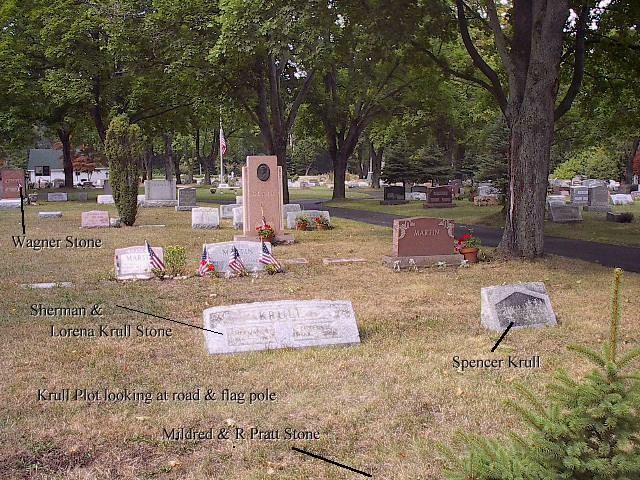 Spencer was interred was in Lot 4, Sec. 5, Clarence Fillmore Cemetery, Clarence, NY. Following the funeral, the family met at the residence of Spencer's parents in Rapids, along Tonawanda Creek south of Lockport. There, in the evening, they gathered under two huge black walnut trees in the front yard and sang. 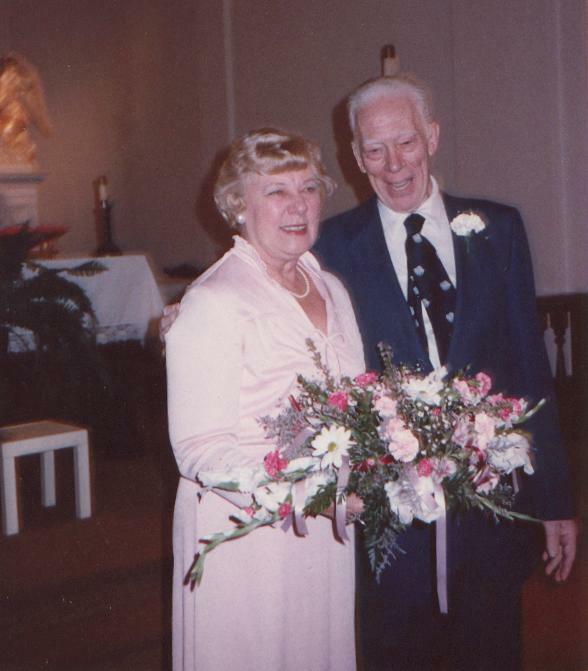 Wedding of Gladys Ehrler (née Schwert) Krull to Raymond Brecker, October 11, 1986, Saint Rose of Lima R.C. Church, Buffalo, NY. From there on Gladys' love and energies focused on raising her daughter Nancy. 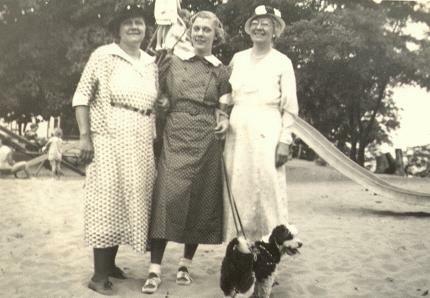 Catherine lived at 1088 Parkside with Gladys and Nancy and helped care for Nancy while Gladys was at work. On August 20, 1963, at the age of 15, Nancy died after a prolonged and painful battle with brain cancer. Gladys then cared for her mother until Catherine's death in 1967. On October 11, 1986, Gladys married Dr. Raymond Franklin Brecker at Saint Rose of Lima R.C. Church, in Buffalo. Raymond's Social Security Application indicates that he was born on March 22, 1914, the son of Joseph M. and Hilda C. (née Kencher) Brecker. Gladys and Raymond spent their summers in Buffalo and their winters in Florida. The Social Security Death Index indicates that Raymond died on March 8, 1989, in Bradenton, Florida. Gladys made Bradenton her permanent home. After a prolonged battle with cancer, Gladys died on March 17, 1999, in Bradenton. 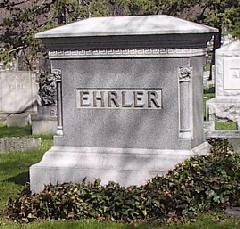 Her cremains were interred in the Ehrler family plot, Section 26, Lot 134, Forest Lawn Cemetery, Buffalo, NY. Information for this web page was provided by: Esther Wagner (cousin of Gladys), Kenneth Ehrler Schwert, Sr. (brother of Gladys), Warren S. Krull (nephew of Spencer Sherman Krull), and Virginia Henderson Krull (sister-in-law of Spencer Sherman Krull). 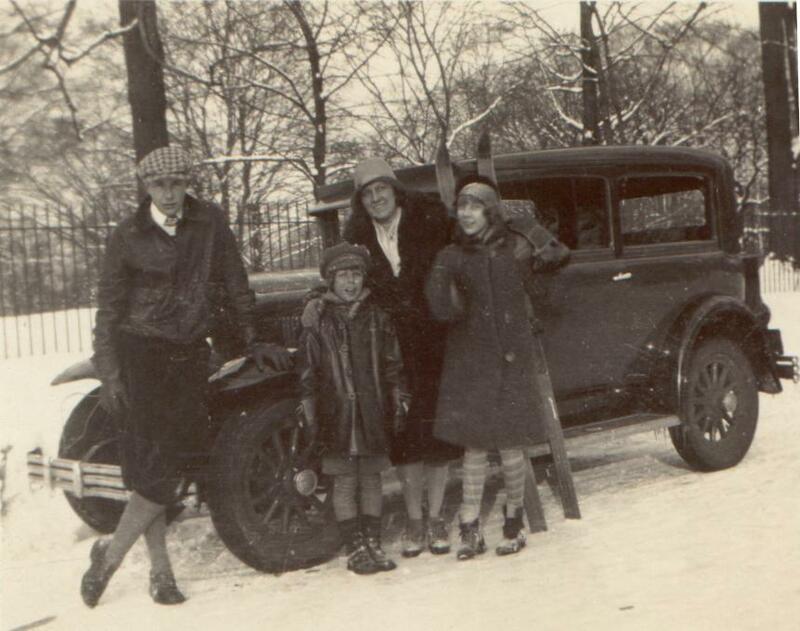 Edward, Kenneth, Catherine (née Ehrler) and Gladys Schwert, Buffalo, New York, 1929. Undated photograph showing Catherine (née Ehrler) Schwert, her daughter Gladys, and Catherine's sister Clara (née Ehrler) Wagner. Undated portrait of Gladys Schwert, probably taken in mid-1940's. 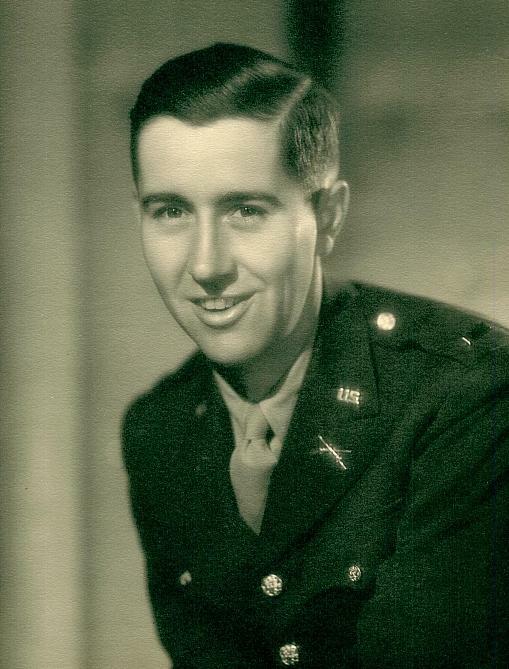 (Photo courtesy of Kenneth E. Schwert, Sr.
Spencer Sherman Krull, portrait photo, probably taken about 1942. 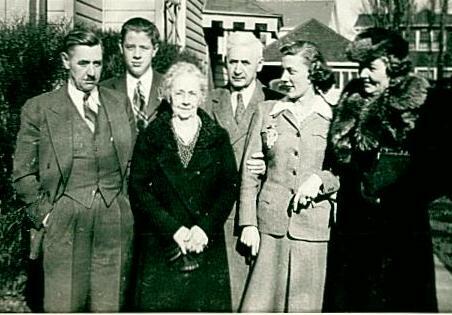 Gladys Ehrler (née Schwert) Krull, with the Krull family. 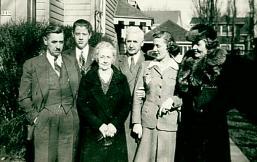 Left to right: Raymond Pratt Krull (father of Spencer), Raymond Pratt Krull, Jr. (brother of Spencer), Lorena Pratt Krull (grandmother of Spencer), Sherman Warren Krull (grandfather of Spencer), Gladys (née Schwert) Krull, and Mildred (née Spencer) Krull (mother of Spencer). Joseph August Schwert: Born 1884; died 1963. Catherine (née Ehrler) Schwert: Born 1885; died 1967. Nancy Austin Krull: Born 1948; died 1963. 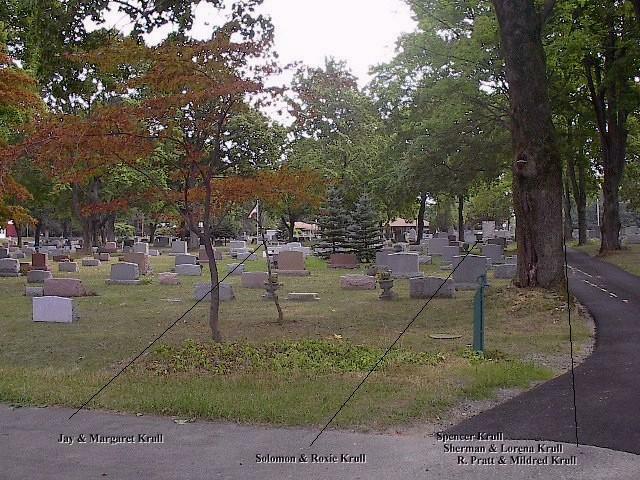 General location of the grave for Lt. Spencer Sherman Krull, Lot 4, Sec. 5, Clarence Fillmore Cemetery, Clarence, NY. 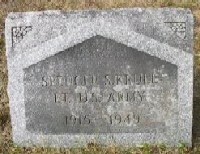 Grave of Lt. Spencer Sherman Krull, Lot 4, Sec. 5, Clarence Fillmore Cemetery, Clarence, NY. 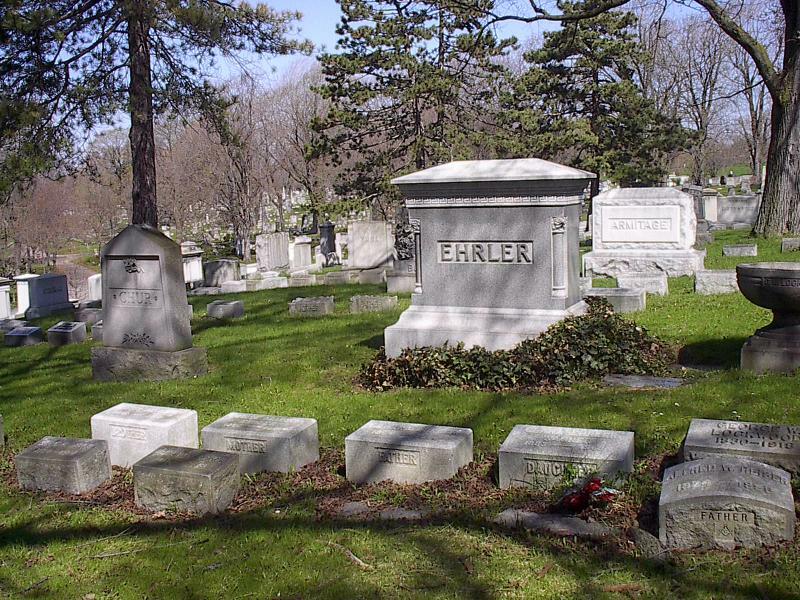 Ehrler plot in Section 26, Lot 134, Forest Lawn Cemetery, Buffalo, NY, where Gladys Ehrler (née Schwert) (Krull) Brecker is interred. 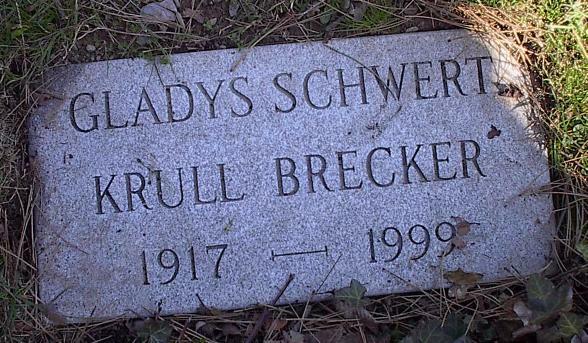 Marker for cremains of Gladys Ehrler (née Schwert) (Krull) Brecker in Ehrler plot, Section 26, Lot 134, Forest Lawn Cemetery, Buffalo, NY. Baptismal Record: Gladys Schwert, baptized October 17, 1917. 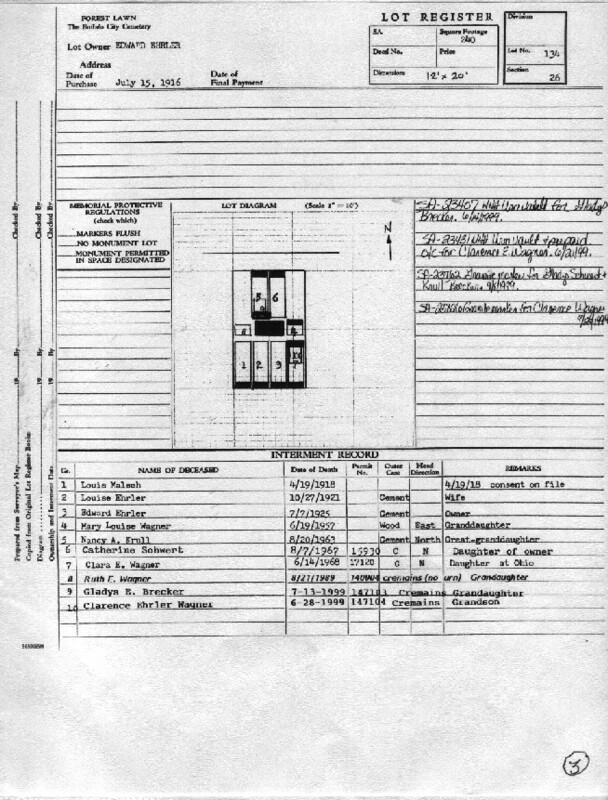 Statement at top of page (not shown on this image) indicates that the baptism took place at at Our Lady of Lourdes R.C. Church, Buffalo, NY. 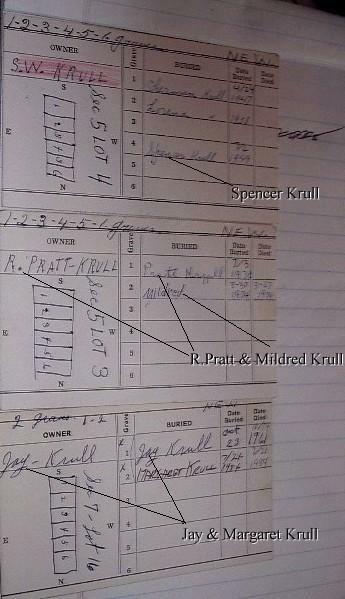 1920 Census Record: 1920 U.S. Census record for Raymond Pratt and Mildred (née Spencer) Krull, and their son Spencer. 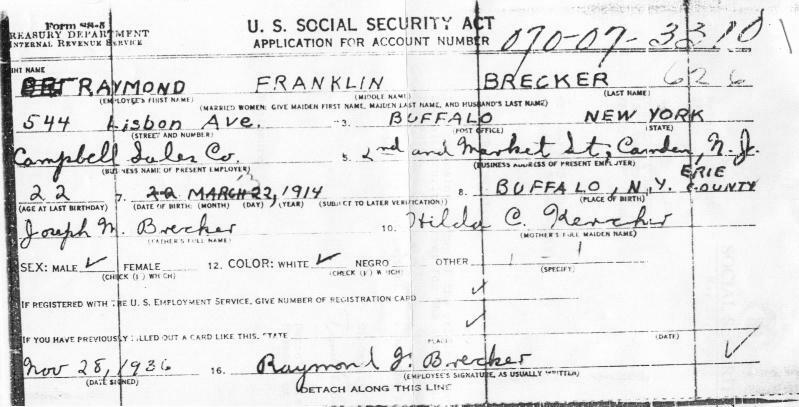 Social Security Application: Raymond Franklin Brecker, November 28, 1936. Social Security #070-07-3310. Social Security Application: Gladys Ehrler Schwert, September 24, 1939. Marriage Record: Gladys Ehrler Schwert and Spencer S. Krull, married September 2, 1947, at Saint Rose of Lima R.C. Church, 500 Parker Avenue, Buffalo. (Record is a notation on Gladys' baptismal record). Obituary: Spencer S. Krull, died on June 29, 1949. 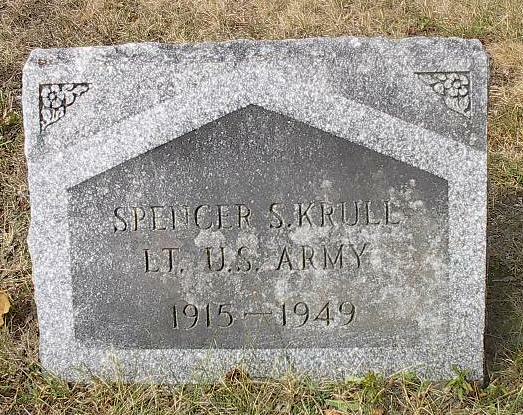 Interment Record: Spencer S. Krull, Lot 4, Sec. 5, Clarence Fillmore Cemetery, Clarence, NY. Obituary: Gladys (née Schwert) (Krull) Brecker, died on March 17, 1999. Notice is from the web service of the Buffalo News. 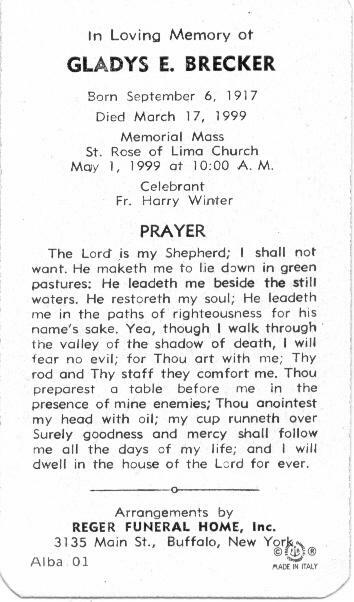 Funeral Mass Card: Gladys (née Schwert) (Krull) Brecker, died on March 17, 1999. Memorial service was at Saint Rose of Lima R.C. Church, Buffalo, NY. Cemetery Record: Ehrler family plot at Lot 134, Section 26, Forest Lawn Cemetery, Buffalo, NY, where Gladys (née Schwert) (Krull) Brecker and Nancy Krull are interred. 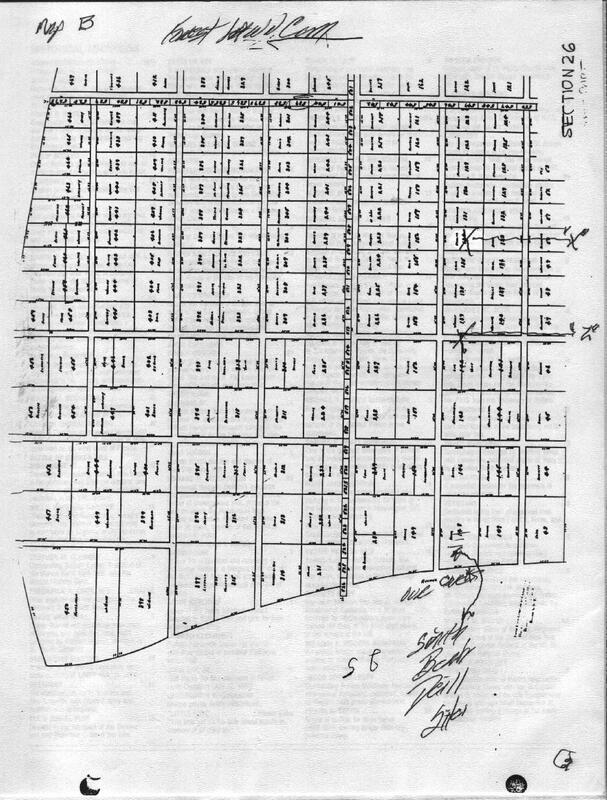 Cemetery Plot Map: Ehrler family plot at Forest Lawn Cemetery, Buffalo, NY, where Gladys (née Schwert) (Krull) Brecker and Nancy Krull are interred.